There are those times when I walk into a place, whether it be a garden, restaurant, or hotel, and just think to myself, “ I could live here.” Nesmon Café in Sherman Oaks is one of those places. Nesmon Café quietly opened just over a month ago. You could easily miss it unless you are walking by. Located between Dixie Canyon and Fulton on the block anchored by Menchies (and personal fave orthodontist Dr. Linda K. Toth), it is a little French oasis in the middle of a very busy block. Owner Nily Yefet-Shalom, who is a Sherman Oaks resident, spent years as an interior designer and also created her own line of vintage cake plates and platters. She expanded into working in café design and has left her mark on such places as Belwood Bakery in Studio City and Little Door Next Door on Third Street over the hill. One day I visited there was a french lesson being taught. The back bookcase reveals just some of the boutiques wares that are for sale. And that sentiment is exactly what I felt passing through the outdoor patio filled with tables and flowers— and then into the small café itself. Indeed, I could’ve walked in off a side street in Paris, rather than Ventura Boulevard. Open french doors evoke an indoor/outdoor feel. Glass counter display cases and an antique cabinet are filled with alluring fresh baked cakes, tarts and pastries, both made on the premises and imported from a French baker; puddings, olives, cheese, jams and more line the shelves. Coffee cups are placed on top of vintage round metal plates. Food is served on vintage tableware from France. Order at the counter and your food will be brought to you. The Maison crepe is generously filled with eggs smoked salmon, crème fraiche and chives —and topped with bechamel sauce. Crepes, made fresh to order in front of you, are a unique highlight of Nesmon Café. Choose from a selection of sweet and savory. Sweet crepes include the Parisienne with nutella and banana; Suzette with butter, sugar and orange liquer; La Crepe with sweet butter and caramel; Marcel with strawberries and white chocolate; and the Confiture with fresh fruit preserves. 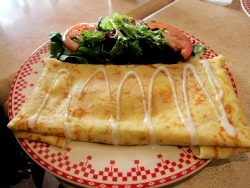 Savory crepes all have a touch of bechamel sauce and include the L’ouef with eggs, mozzarella and tomatoes; Maison with eggs smoked salmon, crème fraiche and chives; Verde with eggs, spinach and mozzarella; and Vegi with variations of grilled vegetables and brie or camembert cheeses. All crepes come with an organic mixed greens. The Tunisian baguette is reminiscent of sandwiches I've eaten in Paris and Tel Aviv. Baguette sandwiches are served with organic mixed greens or chips. 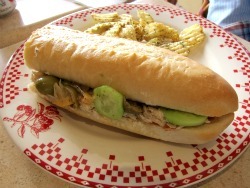 You’ll see the sandwiches pre-made and wrapped on the counter, but no worries, they are made fresh daily. The Tunisian is most unusual for Los Angeles, but just like one you’d find in France or Israel, prepared with a hardboiled egg, cucumbers, olives, pickled lemon and harissa for a perfect hint of spice. The other tasty selections include smoked salmon, egg salad, caprese, club and hummus. 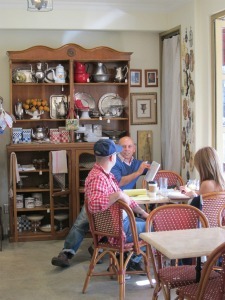 Other menu items include salads, such as beet, nicoise, vegetable, caesar and rosemary chicken. There are fresh soups and quiche daily, as well as French pizza and open-faced tartines sandwiches with such fillings as nicoise, eggs and mozzarella. 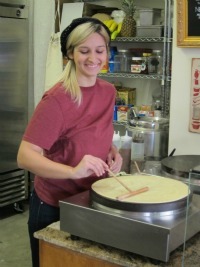 Natalia, who works behind the counter, makes an authentic crepe. Choose from sweet and savory flavors. Shalom says that on Wednesdays they offer a Farmers Market menu from seasonal ingredients found at the Sherman Oaks Farmers Market. Upcoming plans include a variety of new menu items available for take home service, as well as lunches to go for kids. The “boutique” surrounds the cafe — vintage wares, such as tea pots, canisters, aprons, cake plates and platters, fill wall cases, alongside select imports of gourmet salt, jam, oil, crackers, tea and other gourmet items. Currently, there’s also a rather incredible Italian coffee/tea machine from the 1920s for sale. Pick up a basket and create a personalized gift (wrapping is complimentary). 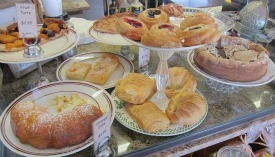 Glass counter display cases and an antique cabinet are filled with alluring fresh baked cakes, tarts and pastries. There’s even chalk and small chalkboard, crayons and a tea set to keep small kids occupied. Nesmon Café is available for catering and private parties on the premises, including tea room parties perfect for kids and adults (just ask about the special menus!). If you can’t make it to France, Nesmon Café will give you just the quick fix you need. 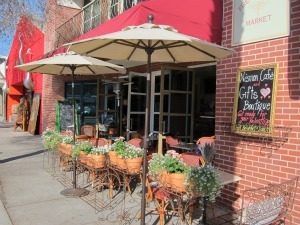 Nesmon Cafe, 13333 Ventura Blvd., Sherman Oaks, (818) 855-8818 (between Fulton and Dixie Canyon). Open 7 a.m. – 6 p.m. daily. Order at counter. Free WI-FI.